Actress and singer who played Phoebe Thunderman on Nickelodeon's The Thundermans. She was also cast as Ellie in the 2015 Nickelodeon TV movie One Crazy Cruise. She appeared on Nickelodeon's Ho Ho Holiday Special in 2015. She attended the Pine Crest School in Florida. In 2011, she moved from Florida to Los Angeles to pursue an acting career. She was born to Broadway performer parents in Boca Raton, Florida. Her father's name is Danny. She briefly dated actor Jack Griffo in 2017. 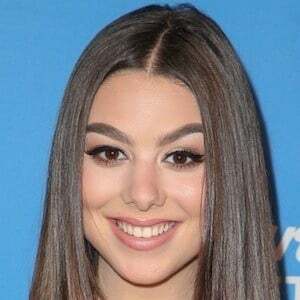 She has co-starred with Jack Griffo in the television series The Thundermans.